I'm not sure if my stay in Hoi An flew by or the opposite but I extended it to just over a week. I quickly lost track of time, settling into a delirious painting, cycling, shopping, eating, repeating existence. Aside from the numerous trips to tailors and fine dining I used my time there to really push my painting. Until a trip to Morocco earlier in the year I'd never been brave enough to tackle streetscenes so this was a great opportunity to practice. The lanterns overhead made for an exciting if unusual way of describing perspective and adding colour even on grey days. I won't lie, I found it very difficult and there was a lot to cram into each painting with all the higgledy-piggildy ochre houses and overflowing shop fronts not to mention the people. I restricted myself to small 20 x 30cm canvases and after a couple of attempts I began to see an improvement. One night I even tried a nocturne but I had not anticipated the effect my head torch would have on all the insects namely the mosquitoes! When my days in Hoi An finally came to an end I was incredibly sad to leave. I'd been looked after as if I were a family member by the womderful women who ran Charming Homestay and had come to love the town and the gentle way of life. 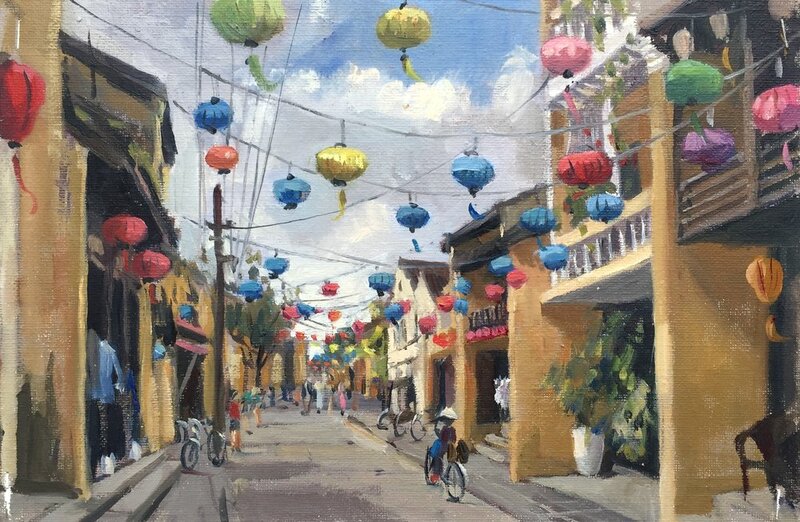 My memories of the place are a haze of lanterns, bike rides, spring rolls, paintings and also a rather unfortunate leg wax where I found myself the guinea pig for no fewer than four teenage apprentices but that's another story. The bus journey to Hue was an experience. I had a clear view of the driver in his rear view mirror, who decided to use the four hours to catch up with several friends on the phone. And no not using hands free, more lounging in his seat holding his phone to his ear, only half watching the road and occasionally roaring with laughter at whatever lad's banter was being exchanged. At one point when we went through a tunnel he appeared to loose signal so steadying the wheel lazily with one elbow he started texting presumably something along the lines of 'mate I'm in a tunnel I'll call you back in a sec.' When we arrived in one piece in Hue it was bucketting it down and it hasn't stopped for three days. I took an over-priced taxi to my B&B which turned out to be a soulless, shabby hotel where not a word of English was spoken. Despite the language barrier it quickly became clear that they had double booked my room but a bit of foot stamping later and they somehow managed to find me one. When I eventually sat on my bed I had a good cry for the first time since I've been away. After a couple of minutes indulging in self pity it quickly became clear that this wasn't going to help. So dressed in all my waterproofs and a very fetching plastic poncho I packed up my paints, bought a brolly and trundled off to the Imperial City. After half an hour of determined walking in the pouring rain and I realised I'd forgotten my tripod and had to walk the whole way back again! I managed to paint the Noon Gate holding an umbrella throughout and surprisingly ended up really enjoying myself. Painting always seems to make everything better. I really wished I'd done my site-seeing before hand though as by the time I'd finished painting I was soaked through and pretty chilly despite the humidity. It was worth it though, The Citadel which lies behind the gates I painted is a vast royal palace laid out over 4km squared. All the buildings have wonderful names like the Hall of Supreme Harmony and the Pavillion of Splendor, and it's situated beside the Perfume River. I imagine some of the goings-on within these walls weren't quite as romantic as the names suggest. On my second day in Hue I decided to go and paint the Tomb of Tu Duc, as it was pouring again but there's a lake at the tomb and on a grey day water and reflections can really brighten up a painting. Having not realised how far out it was I asked my taxi driver to stop at an ATM on the way but found I couldn't withdraw money. This has happened before here so I wasn't too bothered until we'd tried five ATMs and still no luck. I finally managed to withdraw only a small amount of cash even in Vietnamese terms. On discovering I was an artist (all my clothes and belongings are now splattered with paint) Thien, my taxi driver, decided to offer me a discount if I drew him on the way. Bargain! One biro sketch on the back of a receipt pad later and I'd saved myself £1.30 off my taxi ride. That left me enough money for my return journey AND a weird omelette baguette when I got there. Tu Duc was the longest ruling Emperor of the Nguyen dynasty but he never managed to father a son despite having over one hundred wives and concubines. His magnificent tomb took three years to build (finished 1867) and yet he was actually buried in a secret location elsewhere in the city. All those that were involved in his burial were beheaded immediately afterwards and to this day no one knows where his body lies. The joys of standing still hiding under my umbrella means I can eavesdrop on all the passing tour guides! Another soaking wet painting. I got pretty fed up by the end and my arm ached from holding my umbrella. Lots of lovely people stopping to chat though including a tour guide who'd seen me in My Son and a guy who lives just a couple of miles from my home in Gloucestershire and knows my family! Despite the weather related challenges I've faced I've still had a great time in Hue and the buildings and history are fascinating. When visiting so many places it's hard not to have favourites and unfairly compare the next place and the next. It's all part of the journey and much of my inspiration comes from waking up not knowing what adventures each day will bring. I'm now off to Hanoi where I believe it will be raining and a little foggy, arghhh!! !